You have a United States flag and you want to display this treasure in the best possible way. 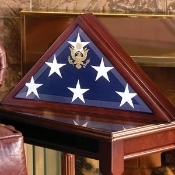 Purchasing one of our flag display cases is a very good way to begin. But now that you’ve got the case, how do you display it properly? That’s a very good question and here is what we recommend. First of all, the size of the flag determines what size flag case you will use to display it. That sounds simple, but it all starts with knowing what type of American flag you have in your possession. There are two different sizes when it comes to our cases, but four different sizes of flag. The “Ceremonial Flag” comes in three different sizes, depending on a variety of circumstances. 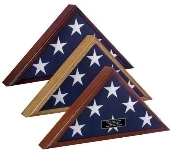 The smallest version measures 3ft X 5ft and will fit very nicely into our Small Flag Case, which has the outside dimensions of 19 inches wide by 8- ¾ inches high. The medium sized Ceremonial Flag measures out at 4ft X 6ft and fits into our Large Flag Case that has the out side dimensions of 25- ½ inches wide by 12 ¾ inches high. The largest sized Ceremonial Flag measures 5ft X 8ft and also fits into the Large Flag Case. Measuring 5ft X 9 ½ ft is the Burial Flag, and this flag also goes into our Large Flag Case. When you look up how to fold the flag, you will find that no two flags are ever folded exactly the same way. They will all be folded in the triangular style, put the finished fold will not be done the same way twice because of the fabric and density of the flag, the weather conditions when folding it, and many more mitigating factors. However, once you have your folded flag, there is a way to best display your flag in your new case. 1.) Place the flag case on a table with the glass side down. 2.) Remove the screws from the back of the case. 3.) Place the folded flag with the field of stars face down against the glass. 4.) Make sure that the folded flag is spread equally within the flag case. Loosen any edges and/or decrease the bulk of the flag in the middle to give it a more thorough fit. 5.) Replace the back of the case and tighten the screws. If you follow these steps, you will have a flag display that truly honors your American hero. There are other ways to display your American Flag if you so choose. Having it displayed in the traditional folding might not be as attractive as you would like it to be. In that case, there is something called the “false fold” which will enable you to display more stars of the flag you want to have on display. There is nothing “disrespectful” about a false fold at all. It is simply away of showing a flag in a different way. A false folded flag allows you to see a perfect star pattern through the front the glass. The 3X5 flag when false folded and placed in the Ceremonial Flag Case will show six stars. When false folded and placed in the large Burial Flag Case will show approximately ten stars. The way you display you r flag is entire up to you. Here’s how you can false fold your flag for a different display. 1.) Cut a piece of matte board or cardboard in a triangle approximately 1/8th of an inch smaller than the inside cavity of the flag case. 2.) Slide the matte board under the flag the flag to the center of the star pattern. Align the peak of the triangle approximately ¾ of an inch above the top point of the star. 3.) Make sure the bottom of the triangle matte board is level with the stars on the bottom row. 4.) Turn the flag with the matte board over and place it in the cavity of the flag case. Fold the remainder of the flag into the flag case, replace the back and reinsert the screws. Now your flag will display the stars as brightly as you want them to shine. If you choose to hang your flag case on the wall, follow these instructions. 1.) Back the top two screws out by one or two turns. 2.) Loop the wire around the two screws, leaving some slack in the wire itself. 3.) Tighten the two screws and hang your flag case by the wire onto a screw, nail, or picture hanger you already have in place. We thank you for the opportunity to serve you. If any question or need should arise, please do not hesitate to contact your exchange, store, or our website. We look forward to helping you honor that special person in your life.